For up-to-date information on lineup, ticket sales, special announcements, go to: Annual Bridge School Benefit Concert. Many, many highlights from the 2013 Bridge School Benefit Concerts in what will go down as another wonderfully memorable weekend. For most, this was another triumphant weekend of great music and fun people coming together for a worthy benefit concert. Others -- as we'll come to later -- saw and heard things differently, naturally. In the Neil department you could not have been disappointed this weekend whatsoever. You had Jack Johnson and Neil Young on "Out On The Weekend", My Morning Jacket and Neil Young on "Harvest Moon", Arcade Fire and Neil Young on "I Dreamed A Neil Young Song", Heart and Neil Young on "War Of Man", and Velvet Underground/Lou Reed tribute “Oh! 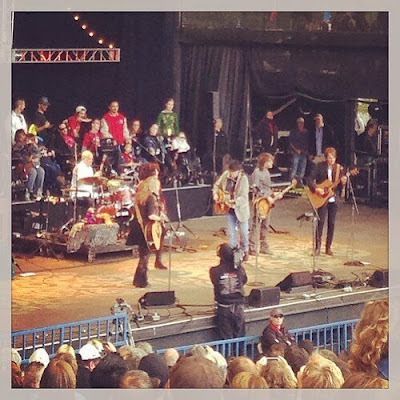 Sweet Nuthin’” with Neil Young, Elvis Costello, Jenny Lewis, and My Morning Jacket. Plus the solo songs that opened each day and the Crosby, Stills, Nash & Young headline reunion. 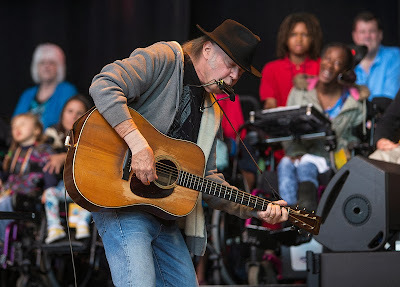 (Other highlights to check out include Neil Young joining My Morning Jacket for “Harvest Moon” at 5:10:00 and CSNY’s reunion at 7:45:10. And the concert reacted to the news of the passing of the hugely influential Lou Reed. In tribute to Reed, My Morning Jacket covered the Velvet Underground’s “Oh! Sweet Nuthin’” with Neil Young, Elvis Costello, Jenny Lewis, and more. As we indicated above, not all were sufficiently impressed. It was an eight-hour acoustic concert that felt much longer, with very few of the expected highlights translating to lasting memories. Indeed, it may have been the least memorable of the roughly two dozen Bridge concerts that I've attended. One of the most troubling issues with the Bridge concerts is that there are just too many acts. That means short sets, usually around 20-30 minutes, and accompanying set changes that last nearly as long as the performances. It's a poor use of everybody's time, unless, of course, you dig watching stagehands setting up instruments. Then came the hipster-approved portion of the night, as My Morning Jacket, Arcade Fire and Queens of the Stone Age filled the next three slots on the bill. Regardless of the quality of the offering -- and Arcade Fire did deliver the set of the night -- it was still too much new music grouped together. In retrospect, organizers should've mixed it up a bit, and given Heart and Johnson later starts, so that the majority of the crowd didn't have to go so long without hearing a song that it recognized. It is sad that a veteran music critic like Jim Harrington seems to miss the entire point of the exercise, i.e., it's a benefit concert to help disabled kids. 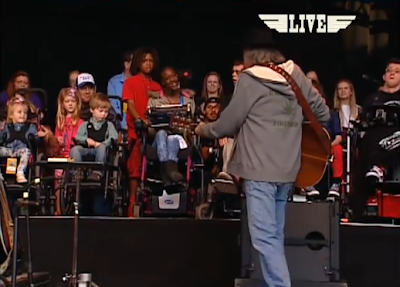 An acoustic concert for the kids and their parents who are literally sitting on the stage. About celebrating the miracle school known as "The Bridge" and what Neil and Pegi Young have achieved. About all the school staff, volunteers, and supporters. Critic Harrington approaches the review with a perspective of wanting to be impressed and entertained. Which is OK but misses the point and is like saying Woodstock really wasn't that great because of the crappy sound and weak lighting. Besides all of the once in lifetime combinations cited at top, where else in mainstream music will you encounter the following scene mid-point of the Crosby, Stills, Nash & Young set? David Crosby introduces the song "What Are Their Names" by saying that "We're political." Next, Neil Young pulls up his hoodie and begins to stalk the stage (see top photo) -- all in clear reference to the whole Trayvon Martin saga. Again, the weekend allows one to experience many, many hours of music, an incredible diversity of artists, and some one-off combinations that often work out splendid. So don't be a doubter. Be a believer. Take a chance on love. Lastly, a shoutout for the webcast. Our stream seemed glitch free and there were very few audio/video problems during the webcast -- a pretty flawless experience as these things go. So if haven't already, go to Bridge School: Donate to the Bridge School. 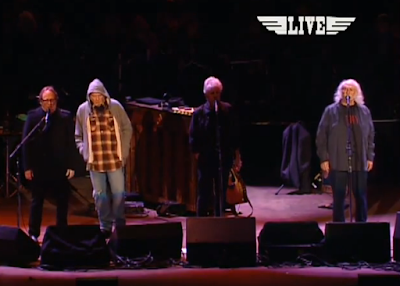 Also, see Photo of the Moment: Crosby, Stills, Nash & Young - Bridge School Benefit - 10.26.13 and more highlights from 2013 Bridge School Benefit Concert Webcast and re-broadcast/re-stream info. Hmm... Pearl Jam ends their fall tour on October 22nd... haven't been to Bridge in 15 years now... hmm. Critics... my heart goes out to them. I think what is failing to be seen here is that he was reviewing the concert. He's a music critic so his comments (or lack of) about what it's all about would have been out of place. I thought his criticisms were valid. But it is a great cause and makes me really proud to be a fan of NY's. Jonathan - *I* haven't been to Bridge in 15 years!